Tawa Baptist Church runs two youth groups, one for high school/college-aged young people and an intermediate-age group (Club Intermed) specifically for those in years 6 to 8. The College age youth group is overseen by our Youth and Associate Pastor, Daryl Judd. Young people meet weekly on a Saturday evening during the school term for social activities and a short devotion. 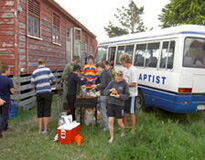 In addition, the youth group goes away on camps and road trips at various times throughout the year. Daryl also runs a number of after-school Bible study groups for those young people who are interested.